Labour Day – also known as International Workers’ Day, or May Day. But do we know why we get a holiday on this day? Do we know why this day should be celebrated? No? Well, it’s never too late to learn. Let’s go back in time a bit – 1886 Industrial era, United States – Chicago. In the headlines of journals across Chicago, the title the Anarchist is boldly highlighted. In the backwaters of Chicago the word on the lips of foreign immigrants and the Chicagoan working class alike are Anarchism and Socialism. The working class is tired of hours of slaving in industries with only a few pennies to show for their work, angered by needless deaths in their work places, and most of all tired of the capitalist rule which only seems to fill the pocket of the industry owners. A desire for change swept across the hearts of workers and soon labour unions were populated by anarchists and socialists. While socialism was promising, for most Anarchism was futuristic – the ideology held promises of a non-hierarchical system. The ideology held promises to change the working world forever. Thus began the movement headed by trade union organisers who would be known as the Anarchists. Launched by the American Federation of Labour, the movement was a fight to reduce working hours to eight hours a day by May 1, 1886 – on this date, workers were to stage a nationwide strike. Leading up to this date, labour unions, man and woman, black and white, skilled and unskilled, struggled to further their ideals. On May 1, 1886, 300, 000 workers in 13, 000 businesses went on strike nationwide. 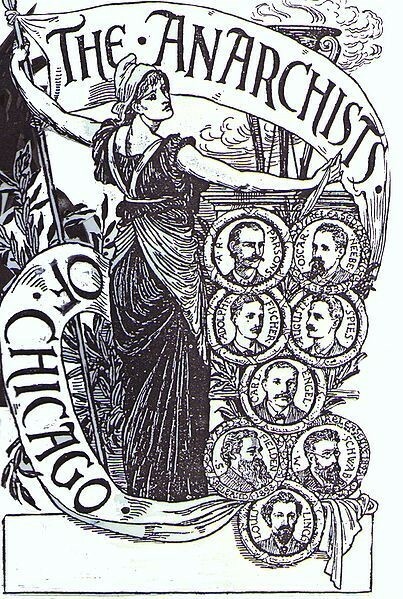 The Chicago Anarchists were the most active in this propaganda movement, leading to a striking number of 400,000 workers walking in the streets of Chicago. On the third day of the strike, hostilities broke out between the police and workers at the McCormick Reaper Works, who were holding a peaceful assembly; the violence escalated, leading to the death of at least one worker, and multiple wounded. Following this unjustified assault started by the police forces, a peaceful protest was held at the Haymarket Square – involving a few speeches as a symbol of outrage at the assault perpetuated by the police force. Despite the obvious fact that the assembly was of no threat and the pleas of the organiser that they were ‘peaceable’, in the evening as the protest ended police forces launched an attack with 180 men against 200 protesters. In the midst of the outbreak of violence that followed, a bomb allegedly thrown into the ranks of the police by the workers exploded, killing one police officer, fatally wounding five, and injuring about seventy. Thus started the manhunt targeting Anarchists and Socialists, fueled by the statement of the State Attorney – “Make the raids first and look up the law afterwards”. Though the number of police casualties was stated, nobody knows for sure how many civilian casualties were incurred in the violence that followed. After the fire of vengeance, masqueraded as a fight for justice, burnt its course, eight men of whom only three were present at Haymarket that evening were brought to trial for being ‘accessories to murder’, and mostly due to their Anarchist beliefs. It was obvious the trial was not in favor of the accused, as the prosecution had announced publicly that ‘these fellows are going to be hanged as certain as death’. The defense was not allowed to present any evidence, the case was not investigated and the jury was not chosen by the usual method of random selection. Instead, it was made up of people susceptible to being biased businessmen, their clerks, and a relation of one of the dead policemen. The scene had been set for the eight men to be hanged as an example to the masses, in order to deter any further turmoil. After the international campaign that followed this sentence, the state reduced two sentences from death to 15 years imprisonment. On November 11, 1887, four were hanged and one cheated the noose by poisoning himself in his cell the day before. 600,000 workers attended their funeral to pay homage to their bravery and to the fight they led. The campaign to free the three other prisoners never ceased, and six years later they were pardoned on the account of innocence. Evidence which later surfaced showed that the bomb in question was thrown by a police officer under the orders of his captain. And this is why we celebrate May Day, internationally – to pay homage to these visionaries for the sacrifice they made, for the good of the masses. Even until now the words of one of the men who died, his name recorded simply as Spies, still rings with the rare clarity of truth. “If you think that by hanging us you can stamp out the labour movement… the movement from which the downtrodden millions, the millions who toil in misery and want, expect salvation – if this is your opinion, then hang us! Here you will tread on a spark, but there and there, behind you – and in front of you, and everywhere, flames blaze up. It is a subterranean fire. You cannot put it out”. Tags: Haymarket Affair, Industrial Revolution, Labour Day, May Day, The Chicago Anarchists, Workers' Day. Bookmark the permalink.